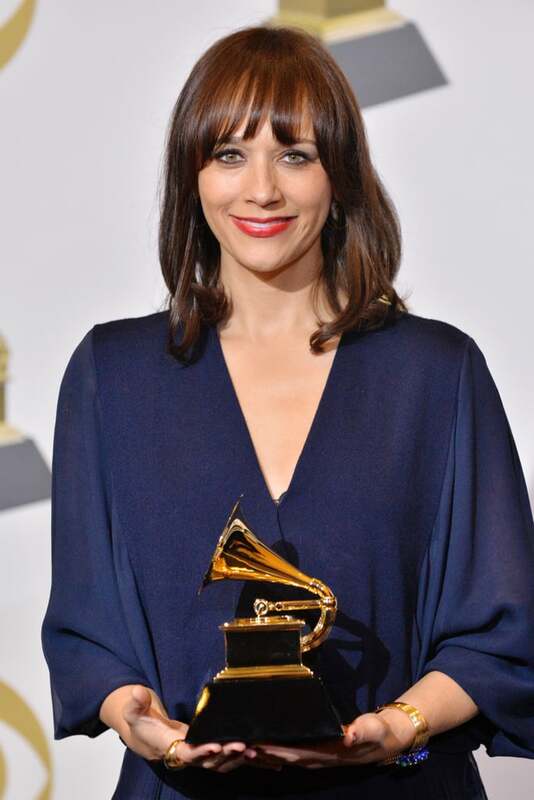 I got to send the incredible actor, producer, director, client, and friend Rashida Jones to the Grammy’s last night, and she added one more title to that list…GRAMMY WINNER! I am so proud!!! If you haven’t seen her documentary, Quincy, you’ve gotta check it out. As usual, she was a stunner, and with her navy dress, I went for a look that was all about healthy skin, a bold lip, and a gold eye. We just wanted to create something really magical, and to get her skin ready, I used one of my tried-and-true brands, Kiehl’s!! I used two masks to prepare and hydrate her skin and lips: Kiehl’s Calendula & Aloe Soothing Hydration Masque to prep her skin, and then Kiehl’s Buttermask for Lips. I let the Calendula mask absorb for 5 minutes before wiping it off with a warm washcloth to start on her skin. I left the Buttermask on to treat her lips while I worked on the rest of her skin. Next, I applied Kiehl’s Creamy Eye Treatment with Avocado under her eyes, and used Kiehl’s Hydro-Plumping Re-Texturizing Serum Concentrate to instantly plump and wake up the skin. It works IMMEDIATELY it’s crazy!!! I finished with Kiehl’s Ultra Facial Cream all over the whole face and neck. Loooove a good face cream and this is one of the best. I lined and shaped the brows with Thrive’s Infinity Waterproof Eyebrow Liner in Audrey, and set them with Milk Makeup’s Kush Fiber Brow Gel in Dutch. Rashida really wanted a gold eye, so I used MAC Eye Shadow in Twinks and then Antiqued on the lid. I used Charlotte Tilbury Rock ‘n’ Kohl Eyeliner in Amber Moon all over the top and bottom lash line, as well as on the water line. I then placed Lashify Lashes in Style 12 on the outside of the eyes and Style 10 throughout the top lash line. I finished the eyes with Wander Beauty’s mascara on lower lashes. I started with Cover FX Watercloud Primer then Cover FX Power Play Foundation (use my Cover FX code JAMIEMAKEUP for a discount! ), and used Josie Maran’s Argan Enlightenment Illuminizing Powder Veil for highlights on the cheeks. I blended Stila Convertible Color in Gerbera and Petunia for a pop of color, and took down her T-zone with Black Opal Translucent Powder. Rashida’s bold lip is Armani’s Rouge D’Armani Matte Lipstick in 400, topped with Kiehl’s Love Oil for Lips in Botanical Blush. And right before she walked out the door, I pressed Kiehl’s Daily Reviving Concentrate on her cheeks for a natural glow. Did you love the look?! Let me know if you try any of the products (especially Kiehl’s…I’m obsessed). If you haven’t signed up for my crew, do that too!! We’ve got a BIG announcement this week! Really though. I’m not just saying that. It’s a big deal.